We some lovely parks, Birkenhead Park, for instance, designed by Joseph Paxton, was a great inspiration to Frederick Law Olmsted who designed New York’s Central Park was my playground when I was growing up, god we would spend whole day’s there and never get bored. It’s had a face lift over the past few years which was well needed, oh and there’s a big new cafe/walk-in centre there now which offers all sort’s of activities from walk’s around the park to fishing in the lakes and in my opinion a brilliant addition and well worth a visit if you’re ever in the area. 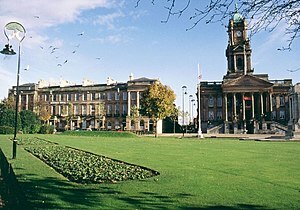 We have Hamilton Square which is no longer a square by the way, it’s more sort of circular now since it too had a face lift and the Town Hall now has a museum incorporated into it. The gardens in which the epitaph stands are still beautiful though, especially in the summer when they are full of flowers. 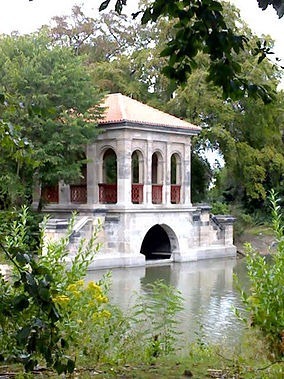 This entry was posted on Tuesday, July 5th, 2011 at 1:59 pm	and tagged with A-Z, Birkenhead Park, Hamilton Square, postaday2011, River Mersey and posted in A-Z, Blogging. You can follow any responses to this entry through the RSS 2.0 feed.